Tomorrow is Groundhog Day! 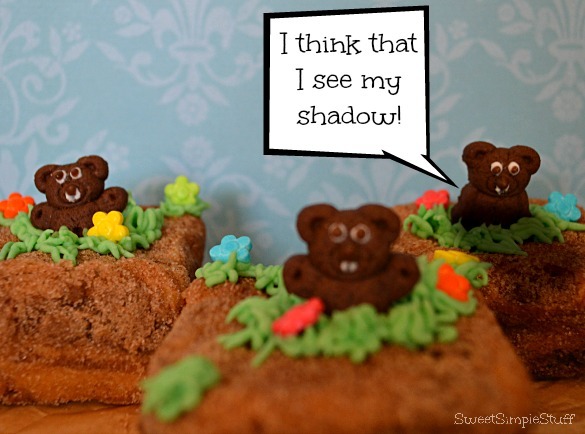 Will Punxsutawney Phil see his shadow or not? Are looking forward to six more weeks of winter or are you ready to see some spring flowers? I’m sure some of you are ready for the cold weather to end, especially after the recent snow storms. Here in California, snow pack is much-needed for the water supply. We will just have to wait and see what Mother Nature has in store for us! 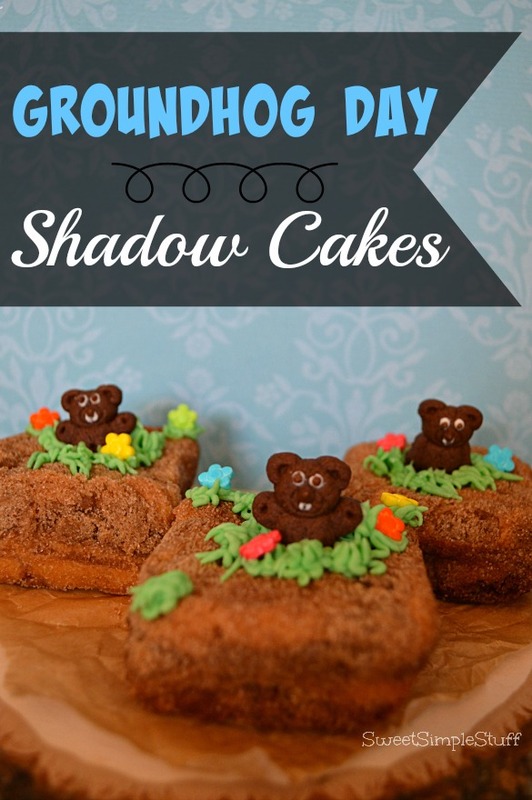 Whether you are hoping for winter or spring … start your morning with Groudhog Day Shadow Cakes! I’m multi-tasking right now … watching the Super Bowl and writing this post. It’s probably a good time to run to the grocery store and buy the supplies to make these guys … bet the stores are pretty empty! 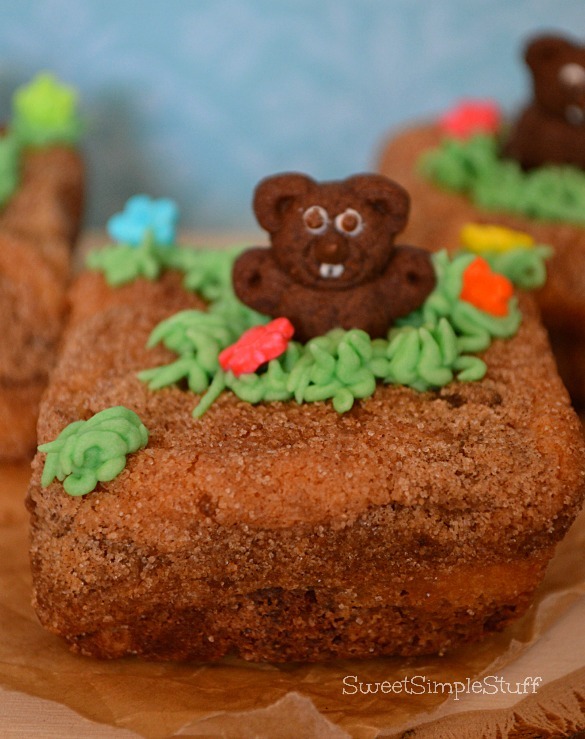 Hostess Coffee Cakes were the perfect choice … cinnamon sugar looks like dirt! I had some green frosting left over from my Football Scoring Play Brownies … otherwise I would have just bought a tube from the store because very little frosting is used. Teddy Grahams don’t look like bears, after teeth are added. Flowers sprinkles are just cute and I know that some of you are pulling for spring! Now, let me tell you … making those eyes and teeth were a little tricky for my old eyes … natural sunlight and $1 cheater glasses got me thru it, lol! I hope your eyeballs are better than mine! Use a toothpick to apply melted white chocolate on Teddy Grahams for eyes and teeth (use a clean toothpick to create a line between teeth if necessary), let harden. Use another toothpick to apply dark chocolate on eyes and nose, let harden. 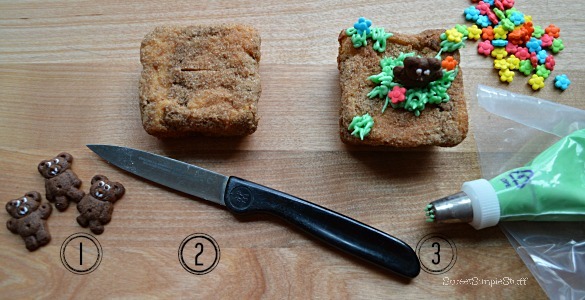 Use a knife to make a small slice in the top of cake and insert teddy graham. Add grass … I used a “grass” tip (Ateco #133, Wilton #233) with a disposable bag. If you don’t have one … use a very small star tip or just snip the tip off of the bag … it all works! Sprinkle a few flowers around, just for fun! Happy Groundhog Day! Are you hoping he sees his shadow? Know what you mean about tedious work, but they’re real cute and those of us who make things appreciate the work that it took. I wonder if the real small edible eyes would work. Have you ever used an OTT light? They simulate daylight and are used mostly by people who sew. Selling point – You can immediately tell the difference between navy & black fabric/thread. You used to have to buy the whole fixture, but now they sell screw in individual bulbs which fit lamps you already have. JoAnns have them ($15 per bulb) and they’re worth every dime. Use your 40% coupon. They also sell small table top lamps which they often have on 50% off. The cover folds down over their long bulb to protect it. I’ve had mine for years & haven’t had to replace the bulb yet. Try a screw in type bulb in your bathroom fixture. You’ll be AMAZED. Thank you Tavette 🙂 I was just telling Colleen that I don’t have small enough candy eyeballs … wonder if they exist! I don’t have an OTT light, but have been thinking about getting one. I will check out the bulbs … with a coupon, of course!!! Oh, Brenda those are Adorable. Cuteness all the way. Now, onto the eyes. Party City, Michaels, I think some Target Stores, Hobby Lobby, etc. sells those Candy Eyeballs Icing Decorations. I just don’t know how big they are in size cause never really paid that much attention to them Those will save a lot of headache in the future if you decide to put eyes on anything . I got to thinking, for the little groundhogs teeth, why couldn’t a person use some small, tiny; (or cut to size) slivered almonds. Slivered almonds was the only thing I could think off right off hand that a person could use for the teeth. These would be cute made into cupcakes, spread with just alittle chocolate icing and topped off with crushed oreo crumbs (dirt) and the little guy peaking out of the cupcake center. Regarding the eyeballs and teeth … I have a variety of sizes … nothing small enough. Since I was using the white chocolate for the eyeballs … went ahead and used them for teeth. How would you make the almonds stick? 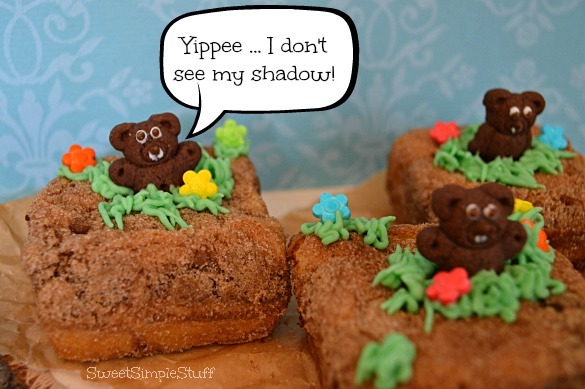 Cupcakes would be adorable … appreciate all of your input and your hubby’s, too! Just thought. Why not use small pieces of white fondant for the teeth, cut to desired shape and secure with alittle icing.